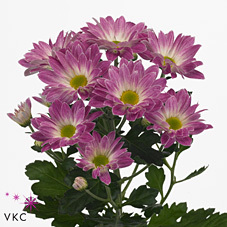 Toshka is a pink, white & green variety of spray chrysanthemum. Spray chrysanths are multi-headed, approx. 70cm tall & wholesaled in 20 stem wraps. We can deliver wholesale cut flowers, foliage and floral sundries to most addresses in Mainland UK and do not insist on a minimum order value. We can deliver directly to you door five times a week. For certain postcodes in Scotland such as Aberdeen and Inverness, delivery can take up to 48 hours to deliver due to the delivery courier used. For more information, please read the section below 'Non deliverable Areas in the UK' or get in touch on 01394 385 832. Bank Holidays in Holland & the UK can affect order & delivery days - Please call for more info. For certain areas, the delivery can take up to 2-4 days to deliver (depending on the location), therefore It is not possible place an order on our website. Please contact the office on (+44) 1394 385 832 on how to process the order, advice on the flowers, types of delivery & delivery costs. Please view our hours of business to make sure we are open at the time of your collection. Orders cannot be left for collection outside of our premises out of hours. All UK delivery costs are fixed, which means you can't pay any more than the published prices - you can order as much or as little as you like for these prices. If your order is for floral sundries only without flowers - delivery is charged at just £7.95* per order. * All quoted delivery costs exclude UK VAT. IMPORTANT: Always aim to have your wholesale flowers delivered 2-3 days before your event to ensure plenty of time to hydrate & condition them correctly. We would strongly advise against receiving the wholesale flowers the day before the event or the day of the event. In addition, please note that the varieties such as Lilies, Freesia, Alstroemeria, Peonies can take time to fully open and develop. Feel free to get in touch on (+44) 01394 385 832.